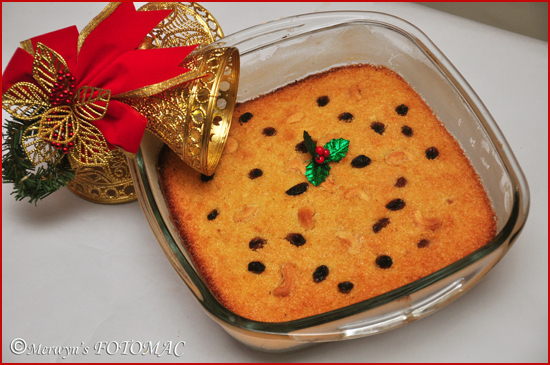 Baath is a traditional Goan Christmas Cake. 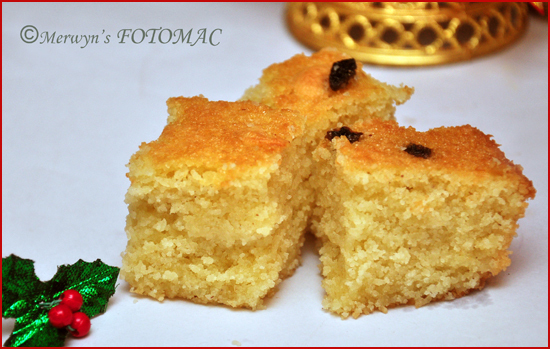 It is a rich & moist semolina/rawa & coconut cake. I remember the times my grandmother used to make this cake in a traditional clay oven which we had bought in the Mapusa market in Goa way back in the early 70s. Throughout our journey by bus from Goa to Pune we had to handle the clay oven with great care. We had wrapped it with lots of cloth & there was a big fuss about its safety. I never understood then, the importance of it until much later in life.. It was such a relief when we reached home, opened the packing & found the oven safe in one piece! We also had a clay stove for a long time. In those days we did not have a cooking gas connection. It used to take quite a few years to get one. We used to light the clay stove with raw coal & once it was properly lit, it would last us the entire day & night. Pune would have very cold wintry nights in December & all our cooking, baking would be done on this clay stove. The heat of the stove also kept us very warm in the nights. The rich fruit cake, bolinhas & the traditional baath would be baked in the clay oven on the clay stove. The lid of the oven had a depression on which my grand mom would keep live charcoal on it which would help in the baking. The aroma of the goodies being baked would spread in the house as well as outside. The neighbours would come to have a peek & would be curious to know what was being baked. The goodies baked in the clay oven is something to be experienced. The bakes would be so delicious. My uncle still uses the same clay oven & the clay stove inspite of a gas connection. Blend fresh scraped coconut with ½ cup water in a blender/grinder to a paste. Beat eggs till light & fluffy in a sufficiently large bowl, add coconut paste & continue mixing. (I used a hand blender). Then add slowly rawa, icing sugar, flour, baking pwd., corn flour, salt to the above mixture with continuous mixing. Beat butter/ghee in another bowl & add it to the above mixture & continue mixing. Cover & keep the batter for 6-7 hours ; preferably overnight. Add vanilla essence & mix well. Transfer the batter in a greased & lined baking tray/glass dish & top with dry fruits. Pre-heat oven to 165C & place the tray at the centre of the oven. Bake for 45-50 minutes or until a knife or toothpick inserted in the centre of the cake comes out clean. Cool thoroughly. Slice the baath & enjoy. You may use dry dessicated coconut if you like. You may add food color to the batter if you so prefer. Please suggest a substitute for eggs in cakes as my family doesn't have eggs. Thank you for this lovely recipe.It was wonderfully moist,although,I might add some extra sugar next time.It did not brown on the top at all,even though I followed your instructions to the 't'.However,it still is a wonderful cake-can't stop eating it! One Word – "Mouth Watering Blog" You made my mind think again.One thing to tell you that i am very foody person.Would love too see few of more irish recipes from your side. Wonderful. This brings back memories of my own grandmother making 'baathk'. Do you by any chance have a photograph to share of the clay oven your grandmum used?